← Is Rising Thunder the most accessible fighting game yet? Alexandra Orlando: How is LoL Ladies Battle different from other women-only e-sports initiatives in the past? Bil “bcJUMPman” Carter: This program is unique because it has AfreecaTV’s name on it. What makes it so appealing is that every team has one of the famous AfreecaTV broadcasters as the coach. There is also one player who is very famous in Korea known as Female Faker, but because [her] team didn’t qualify for the summer tournament, there isn’t another standout player that captures the media’s attention. So the media has kind of been a focus away from the individuals on the team, and more towards the team as a whole represented by the celebrity. Joshua “PiscatorJosh” Lee: I’m honestly not too familiar with other big eSports events that consist of exclusively women or have a large focus on women. The LoL Ladies Battle is the first considerable tournament I’ve seen in eSports that was of that nature. I feel like I’ve always heard of “girl teams” in eSports like Call of Duty, but I can’t recall a time I’ve seen a brand try and market their female players as anything more than, well, female. Orlando: How does the emphasis on the celebrity coaches and branding affect the careers of the players? Carter: That’s the flaw. 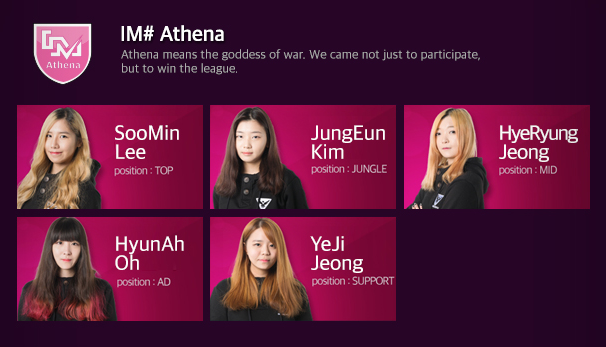 While I can see the effort and reasoning of AfreecaTV to involve women more into the realm of professional eSports, it’s branded more of a temporary spectacle to put women in limelight as a marketing tool. There is no career for these women. They’re all different skill levels, so a successful team in the long run would be difficult because of the skill discrepancy. Outside of that, they hold these tournaments, with no real plan to turn the tournament into a league with a regular/post season. Orlando: That’s really unfortunate, especially for the women that are very skilled and want to go far. Do you see any benefits of the League for these players? Carter: Yes, I agree. If a woman wants to be in the pro scene, she has to prove herself to be as good if not better than the men. Take Renegades’ Support, Maria as an example. I mean if you outperform the rest then you could be put on someone’s radar sure, but Korean culture is still so male dominant that to truly be successful, the women would have to play in another country. If you mean the results of creating an all-out league (we’ll call it the LWK, League Women’s Korea, to make it simpler) would be revolutionary. If it was successful, then other countries would hop on board. There is an issue with that though. From my research in gender studies, separation generally leads to a bigger gap of sexism and gender irregularities. For eSports to be truly gender centric, we would have to integrate into one. It’s not like basketball or baseball where a man is built different physically than a woman. That’s not an excuse for eSports. We have an opportunity to be the first to bridge the gender gap and bring it together. Because I can tell you there are women good enough to play with the men, so why not break down the stereotype of women can’t play sports with men, and show them that in eSports, that stereotype doesn’t exist. Lee: I’m actually an incredibly big fan of the fact that they run actual Leagues. I have a lot of hobbies like poker and fishing that are male-dominated, and they often have “Ladies Events” that are one-day, one-off things, so to make this a league format really emphasizes the competition of it. I like it a lot. Orlando: As a caster, who is not at the games, remotely casting the VODs do you run into cultural or language difficulties when casting? Carter: Oh definitely. As a caster, you want to tell a story. You weave an elaborate series of context and details to connect your audience to the game that’s being played. It encompasses everything from player to player background to skillset to champions played. The key part is the player. Giving an insight on the player helps your audience stay hooked. 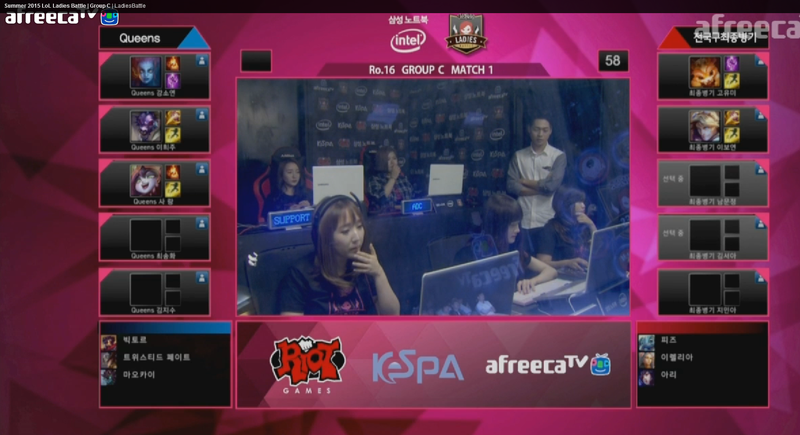 With the initial VOD in Korean, and no knowledge on player backgrounds, our casts are sub par to our usual standards. Instead of explaining details such as these girls and their lives, we have to focus on just the surface. What champ they’re playing, commonalities in playstyle week to week, things that anyone with slightly higher than average game knowledge can figure out by watching. It doesn’t hook you. It doesn’t create the connection. Lee: I have a ton of family in Korea, so not being able to eat my grandma’s awesome fried chicken is definitely a downside. But other than the numerous tech-related things that go into using a VOD instead of a live game, I think the biggest thing is just the style with which we have to approach the cast. Given that casting is essentially a performance like acting or singing, you have to tailor it to your audience. Live casts that happen at like the LCS studios in LA and Berlin can be approached one way because you have a live audience that you’re primarily tailoring the cast to and the fact that you have instant, live feedback is huge. As opposed to guys like Monte and Doa who cast LCK. Their English-speaking audience is largely made up of people who are either watching the games on VODs, or watching at like 3 in the morning. They have to make the cast a lot lighter and a lot more “entertaining” and humored due to the fact that it’s harder to engage when you don’t have that in-person connection. Orlando to Lee: That’s really interesting. Since you are Korean, are there still cultural or language barriers or considerations that come along with casting Korean games? Lee: Oh, there definitely are cultural considerations as well. There was discussion regarding exactly what parts of the VODs we would cover. Sure, we have the games, but there’s a ton of pre-game interviews and backstories that go into the productions as well. Given that I speak Korean on a conversationally-fluent level, the option to translate the entire broadcast was definitely on the table. However, given that Korean culture has a lot of stark differences compared to a lot of the Western audience, particularly the United States, I thought it would be difficult to convey exactly why they were saying what they were. I expressed concern that a lot of what was said might come off as sexist to an American, but is completely standard to say in Korea. There are a lot of references to the looks of the players, so we had to consider the fact that while a Korean audience is completely used to that type of characterization, an American viewer might view it as an objectification issue. So, we made the call to focus mainly on the play. I still make an effort to watch the non-game sections to glean player/team information so that we can add story points. Carter: We WANT a connection. It’s easier to cast that way because you can find a way to relate, create a flowing conversation, but do we have one? No. With no knowledge of anything, it’s essentially impossible to create a connection because you have nothing beneath the surface to grab. Orlando: Where do you see/want to see the future of women and e-sports either in Korea, North America or both? Carter: If I had my way, I would find a way to create a position that finds excelling females. Maybe Riot creates a position that tries to bring women into the professional scene. Help give them the chance to perform on a professional level. Will it be hard? Will it create some animosity? Probably, but in the long run you’ll have pro teams with both men and women that can compete with the old school juggernauts like TSM and CLG. That is an eSports I can be proud of. If we can do that, it’ll bring us so far ahead of the curve of the rest of the world. Lee: Wherever women want to take it, honestly. I just want eSports to be an environment where nobody feels like they “don’t belong”. Only having played League of Legends for under a year limits my scope on just what it’s like for female players, but I spent a number of years actively following and playing competitive Call of Duty. One of my longest-standing teammates was a girl, but girls who competed on a high level were so few and far in between due to the “bro culture” of gaming and the fact that many teams just flat-out refused to pick up female players because they saw them as distractions. I really just want to see a culture where those who are at the top of their trade are the ones who find success, and no petty variables impede that process. Orlando: I hope for the same thing! I had no other questions. Is there anything else you’d like to comment on about Ladies Battle or being a caster? Lee: I really do hope that events like the Ladies Battle help make the eSports environment more welcoming to all of those who want a shot. I know there’s still a bit of a stigma with girls playing video games, but if events like these give those few aspiring talents the courage and confidence to pursue their dreams, it’ll be awesome to see. As casters for the English broadcast, I think we have the potential to be largely influential in creating that sort of attitude shift, and we work hard to present it for what it is: a competition between many teams of fervent gamers.